from Hilltop Yarn in Seattle. from Knit Purl in Portland, OR. This yarn is beautiful, it comes in rich colors, slightly variegated, soft and smooth, delightful to knit. 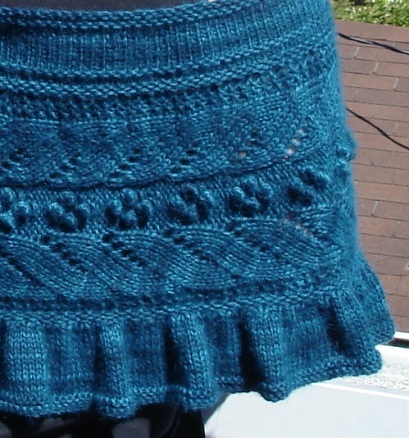 This yarn is a lighter gauge than the yarns specified in the pattern, so I modified the lace panel to make the wavy part wider, adding two stitches and two rows. I also added rows and details to the top and bottom borders. Entry filed under: Finished!. Tags: "Knit-Purl", alpaca, Hilltop Yarn, rhapsody, Shibui, ShibuiKnit. Wow, it’s beautiful, I love it! I haven’t knit myself one yet but I may have to consider this yarn. Man, it looks awesome! Have you decided how to keep it closed in the front? I have to agree it is beautiful. I love the blocking photo. Great and fabulous job. 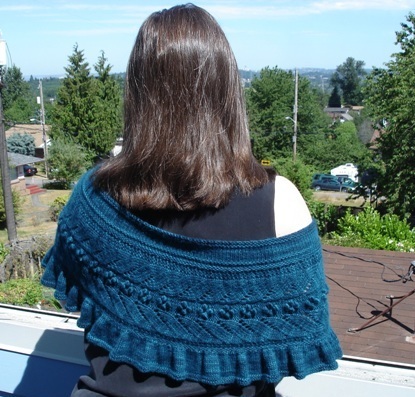 Stunning, as is your pic on Knit Purl’s blog! 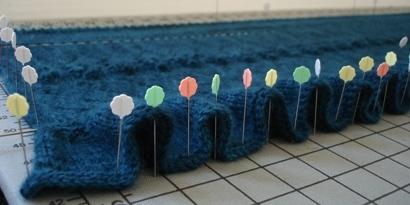 Is that the same yarn you’re using for the pullover you started?